Monica Castro. From Kake ABC News. Posted on October 24, 2016. Original article. A warning tonight on hayride safety. 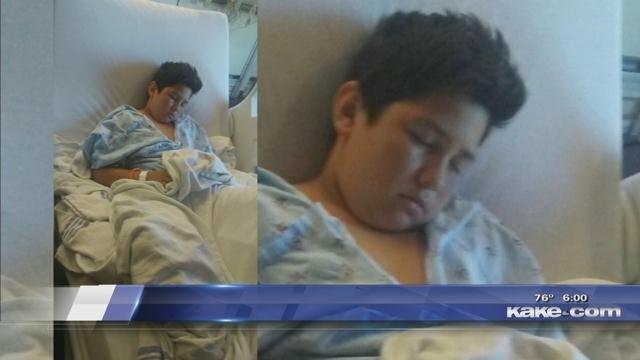 A Hillsboro boy was severely injured while on a hayride with his church group. It happened at a private-farm in Marion County. Filow Cruz is healing up at the Newton Medical Center after a night on a hayride turned scary. His friend, Dayton Foster, witnessed the incident. He tells KAKE News kids yelled to get their legs back on the trailer after it came up too close to a gate, but it was too late for Cruz. Zaragoza expects her son to be in the hospital until Wednesday. He’s already had a surgery last night and has another one to go. KAKE News called the owners of the private farm where the incident happened, they’re calling it a freak accident. The owners have offered rides for 40 years and have never had an accident. With pumpkin patches being popular destinations this fall, many families will likely enjoying a hayride. Gary Bussart, owner of Mr.Gourdman’s Pumpkin Patch says safety is a top priority. He tells KAKE News he doesn’t allow people on the rides to let their legs or arms hang off the sides. “Believe it or not we have never had a kid hurt on the property in 6 years,” said Bussart. “Kids don’t fall off of these, we keep the bales on the side so they are sitting towards the center”. The family-owned farm tells KAKE News they plan on looking at safety precautions for future events to prevent accidents.